We have placed around 68 students in various Bluechip & Multinational Companies such as SAP, Capgemeni, IBM, Mu Sigma, ADP and many more. Paving the road to the future, our course in computer science engineering has a total occupancy of 120 seats in its undergraduate program. 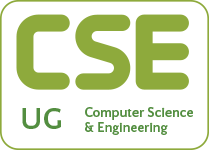 The CSE Department endeavours to be an important regional, national, and international resource center for the development of Computing, IT and Software systems and applications. The department is witnessing a period of exciting growth and opportunity. Aimed to provide an ability to design hardware, software system, component & process to meet desired needs within realistic constraints. Trains a student to function on multi-disciplinary teams, formulate, and solve engineering problems and designing comparing solutions, algorithms & protocols. Gives the student opportunity to pursue a career in various domains including Software Development Front-end, Back-end, Network Design, Network Management, Data Analytics, Software Testing, Maintenance and System Software Development.